On the 7th of November, 1910, a lone cruiser steamed into Esquimalt Harbour. Aged but exuberant, HMCS Rainbow greeted the waiting crowd with a twenty-one gun salute and eased into port. Victoria was now the proud home of the Pacific fleet of the Naval Service of Canada, such as it was. HMCS Rainbow arrives in Esquimalt. Courtesy of the Canadian War Museum. The issue became more urgent than ever before on March 16, 1909, when the British Admiralty turned to the Empire for help in maintaining its mastery of the world’s seas. Four years earlier, the Royal Navy had sparked a naval arms race by launching the HMS Dreadnought, a battleship that vastly outclassed every other warship afloat. Now it looked like Germany’s fleet of “dreadnoughts” might match and exceed Great Britain’s as soon as 1912. Shocked by this news, the Liberals and the Conservatives began negotiating with each other and the British Admiralty. Out of these talks emerged the Naval Service Bill, which Wilfrid Laurier presented to the House of Commons on January 12, 1910. 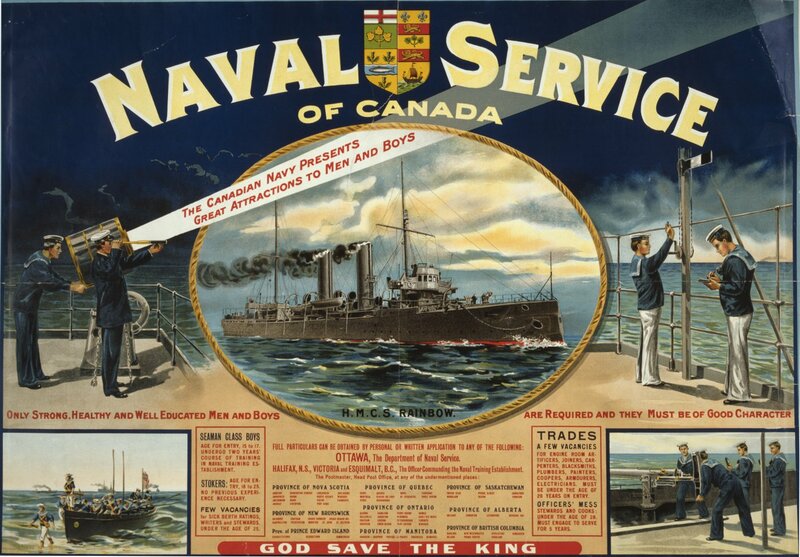 The Naval Service of Canada was born on May 4, 1910, when King George V gave his royal assent. A recruiting poster for the Naval Service of Canada, featuring HMCS Rainbow. Courtesy of the Library of Congress Prints and Photographs Division. That November, HMCS Rainbow reached Esquimalt with a crew of British sailors and officers, on loan from the Admiralty. 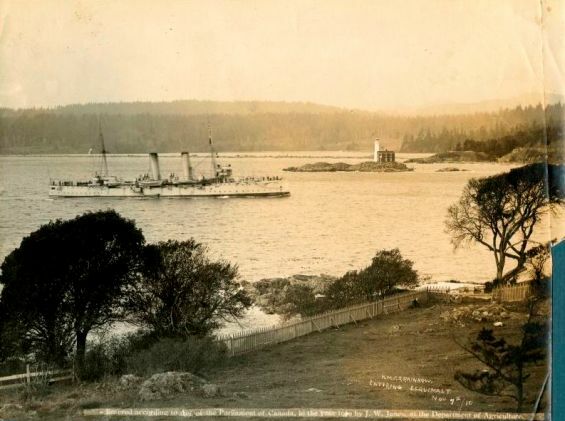 Two days later, the Dominion finally took possession of the old British naval bases at Esquimalt and Halifax, as had been agreed five years earlier. Now, Canada had a navy, and the naval fortifications of Esquimalt were officially the property and responsibility of the Dominion of Canada. Victorian journalists captured the city’s pride and excitement at becoming the Pacific base for the nation’s new navy, writing of the Rainbow’s arrival as “a promise of things to come.” The Victoria Times insisted that the Naval Service would grow to be a mighty force, one which would “add dignity to our name and prestige to our actions” the Dominion was maturing, taking on “new burdens” and sailing into “the ocean of the future.” Unfortunately, rough waters lay ahead for both Wilfrid Laurier and the Naval Service. Many Canadians were dissatisfied with the “tin-pot navy” that Wilfrid Laurier had created. Imperialists despised the Naval Service Act, seeing it as a woefully inadequate measure that threatened the cherished tie between the Dominion and Great Britain. Meanwhile, French-Canadians and ardent nationalists found Laurier’s policy upsettingly imperialistic. Losing support and facing aggressive criticism, the Liberals quietly stepped away from the nation’s fledgling navy. HMCS Rainbow sails by the McLoughlin Point Fog Alarm Building, Esquimalt. Courtesy of Craig Cotter at the Museum of the 5th (BC) Regiment Royal Canadian Artillery. Although the Naval Service did acquire a new name – the Royal Canadian Navy, given royal assent in August, 1911 – the bigger, better ships that had been planned did not arrive. The RCN’s prospects did not improve when Robert Borden and the Conservatives ousted Laurier’s Liberals from power, and the naval question did not become any less controversial. 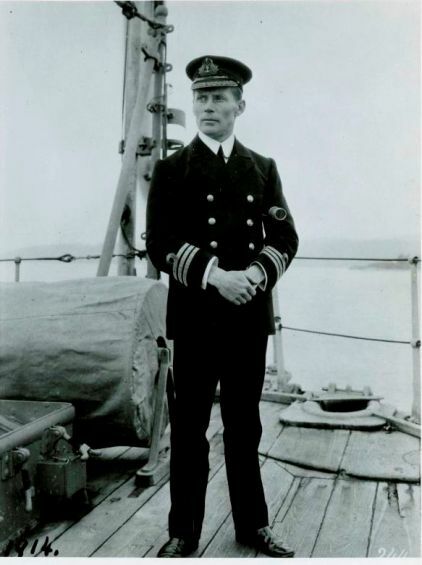 Before becoming Prime Minister, Borden had argued that the best way for the Dominion to support the Royal Navy was through a significant financial contribution to Great Britain’s dreadnought-building program. By the time that Parliament opened in 1912, he no longer felt that this was necessary – but Winston Churchill, then the First Lord of the British Admiralty, disagreed. Commander Walter Hose stands on the deck of his ship, HMCS Rainbow. Courtesy of the Canadian War Museum. Borden’s proposal, the RCN literally struggled to stay afloat. Since coming to power, the Conservative government had halved the funds meant to support the navy, and shown little interest in recruiting new volunteers or disciplining deserters. In Victoria, Commander Walter Hose of HMCS Rainbow could only watch as his ship and the navy she belonged to entered a “heartbreaking starvation time,” desperate for men and money. Yet Hose was not ready to give up. The Rainbow’s captain began to ponder the creation of a voluntary “citizen navy,” and proposed this to his Director, Rear-Admiral Sir Charles Kingsmil; the Director, “very depressed and much afraid” at the thought of what Borden’s government had in store for the navy, insisted that such a thing was impossible. The Minister of the Naval Service, Douglas Hazen, was more helpful. With Hazen’s permission, Hose began to train an unofficial naval reserve unit. Fortunately, Hose and his sailors attracted the attention of both the Governor General and Premier Richard McBride. These esteemed supporters helped to convince Prime Minister Borden to create the Royal Naval Canadian Volunteer Reserve, established on May 14, 1914. Soon after this, Hose was told to take the Rainbow to the Bering Sea to support a sealing ban that was in Canada’s interests. These plans were changed on July 20, when the Rainbow was ordered to sail to Vancouver instead. HMCS Rainbow (left) and the SS Komagata Maru in Vancouver Harbor. Courtesy of the City of Vancouver Archives. L.P. Brodeur, “Proceedings of the 1909 Imperial Conference on Naval and Military Defence,” Fourth day, 5 August 1909,” in L.P. Brodeur Papers, Public Archives of Canada, 43, quoted in Nigel D. Brodeur, “L.P. Brodeur and the Origins of the Royal Canadian Navy,” in The RCN in Retrospect, 1910-1968, ed. James A. Boutilier (Vancouver: UBC Press, 1982), 14. Barry M. Gough, “The Royal Navy’s Legacy to the Royal Canadian Navy in the Pacific, 1880-1914,” in The RCN in Retrospect, 1910-1968, ed. James A. Boutilier (Vancouver: UBC Press, 1982), 9. L.P. Brodeur, “An Address Delivered by Clive Phillipps-Wolley on Behalf of the Victoria-Esquimalt Branch of the Navy League to an Audience in the City Hall, Victoria, British Columbia, Tuesday 14 May 1907,” in L.P. Brodeur Papers, Public Archives of Canada, quoted in Nigel D. Brodeur, “L.P. Brodeur and the Origins of the Royal Canadian Navy,” in The RCN in Retrospect, 1910-1968, ed. James A. Boutilier (Vancouver: UBC Press, 1982), 19. Victoria Times, 7 November 1910, quoted in Barry M. Gough, “The Royal Navy’s Legacy to the Royal Canadian Navy in the Pacific, 1880-1914,” in The RCN in Retrospect, 1910-1968, ed. James A. Boutilier (Vancouver: UBC Press, 1982), 3. Victoria Colonist, 8 November 1910, quoted in Barry M. Gough, “The Royal Navy’s Legacy to the Royal Canadian Navy in the Pacific, 1880-1914,” in The RCN in Retrospect, 1910-1968, ed. James A. Boutilier (Vancouver: UBC Press, 1982), 3. Roger Sarty, “Toward a Canadian Naval Service, 1867-1914,” in The Naval Service of Canada, 1910-2010 – The Centennial Story, ed. Richard H. Gimblett (Toronto: Dundurn Press, 2009), 16. Roger Sarty, “Naval Aid Bill,” The Canadian Encyclopedia. Sarty, “Toward a Canadian Naval Service, 1867-1914,” in The Naval Service of Canada, 1910-2010 – The Centennial Story, 17. “The Incident,” Komagata Maru, Continuing the Journey, Simon Fraser University Library.